“Eric Bolsmann’s The Pretoira Art Museum – The German contribution – is in every respect an extremely well-researched and most attractively accomplished work. It shows the author’s clear appreciation of the artistic qualities of the works by these German artists, and also an erudite understanding of the historical context in which the works were executed and acquired by the Art Museum. The biographies of the artists provide extremely valuable source material. The book is certainly a cultural and historical document of high importance since it illustrates in a very persuasive manner the dynamic influences of German artists, and South African artists of German origin, in shaping our present multifaceted South African culture. It explores a subject which is little known or appreciated and it is certain to arouse much interest among scholars, art lovers and students here and abroad. Council Member of the Art Association Pretoria. Emeritus Professor of Law and former Vice-Chancellor and principal of the University of South Africa. 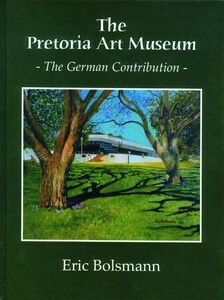 The Pretoria Art Museum – The German Contribution – was published by Be My Guest Publishers with colour and black and white illustrations as a 200-page hard-cover edition in 2005. The book is available from Be My Guest Publishers at R226 icl Vat and postage in South Africa.